OK, gotta run, more cards later today from the Ward Digis collection! Have a Wonderful Day!! 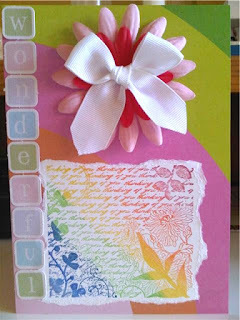 Wow, that is an amazing card....luv the colours on it and luv that big bow. Your card is WONDERFUL I love the colors. Wow, SO colorful and beautiful!! Love it! Ahhhh, you sure did GREAT on this challenge! Love your take on it, the colors are amazing!!!! oh i like how you did the stamp in a rainbow :) fantastic card! !